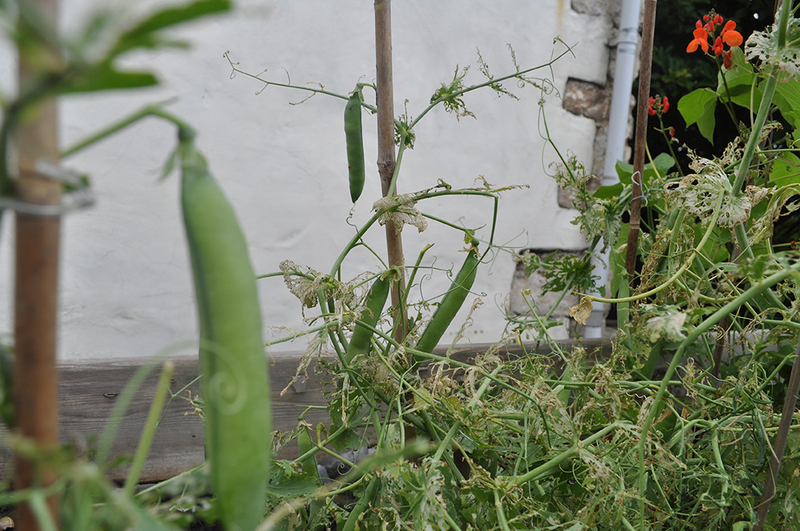 We’re growing a few peas in the garden at the moment. One thing I’ve found since becoming freelance is that tasks such as gardening, that require continual on-going involvement run the risk of being ignored when work gets busy (hence the rather raggedy appearance of this year’s crop). When you have a regular job with fixed hours, it’s easier to focus on non-work tasks out of work – makes sense. When you work for yourself, particularly as I do from home, it can be hard to have fixed boundaries between work and non-work. I’m quite happy with this arrangement; I find living chaotically comes to me fairly naturally, but I have found I’ve had less time to devote to past times such as gardening. Peas are fairly easy to grow, even if you do ignore them for weeks at a time and allow the snails and slugs to munch on them, you’ll still get something; and the kids can have fun shelling them. Okay, the above photo may be pushing the fun element – a resigned acceptance that shelling peas is a minor diversion from shouting and hitting each other. What is definitely true is that fresh peas taste great. Pick them, then eat them. Perfect. Frozen are pretty good, but fresh is best. Peas are eaten the world over, both fresh and dried, and they contain decent quantities of fibre, protein, vitamins and minerals. They also play an important role in genetics. The Austrian monk Gregor Mendel grew and examined approximately 28,000 pea plants in his observations that led to the discovery of dominant and recessive genes, showing that each parent’s genes have a determining say in the appearance of their offspring.